While we await the outcome of the meeting where Heyneke Meyer’s future as coach of the Springboks will be decided, it is interesting to note the career path of Steve Hansen. The information below appears on Wikipedia. Hansen began his coaching career with the Canterbury provincial rugby union team from 1996 to 2001. During his tenure the side won the National Provincial Championship in 1997 and 2001. In 1999, 2000 and 2001, he was assistant coach to Wayne Smith and then Robbie Deans for the Canterbury Crusaders. He became head coach of the Welsh national team in 2002, replacing Graham Henry who was appointed All Black coach. Wales performed well but close losses became a familiar theme during his tenure as coach. Events reached a head during 2003 when for the first time in their history Wales lost every match in the Six Nations Championship and went on to record a streak of 11 consecutive Test match defeats. Hansen coached Wales during the 2003 Rugby World Cup, in which a strong display against the All Blacks and a spirited quarter final loss against England stopped the criticism of his coaching. He stepped down as Wales head coach in the summer of 2004 and was appointed to the All Blacks as an assistant coach under former mentor Graham Henry. Hansen assisted Graham Henry in coaching the All Blacks to a 2011 Rugby World Cup final win against France, ending a 24-year Rugby World Cup winning drought for the All Blacks. He was formally appointed as head coach of the All Blacks on 15 December 2011. In his first games and series as head coach, Hansen guided the All Blacks to a 3–0 series victory over the Irish during 2012 tour. They also retained the Bledisloe Cup for a 10th consecutive year, and Hansen was named IRB Coach of the Year for 2012. His only defeat as coach came against England in the 2012 end-of-year rugby tour. In this year, he was appointed a Companion of the New Zealand Order of Merit, for services to rugby. 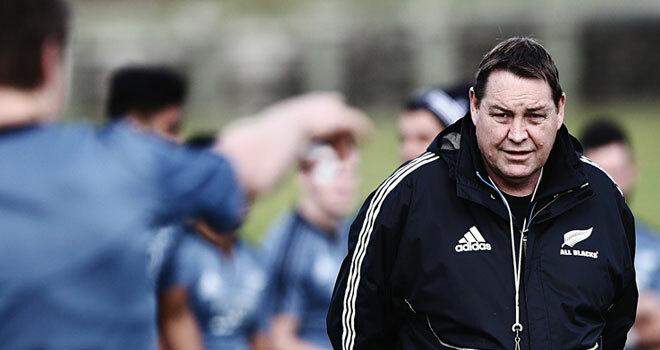 The All Blacks went undefeated in 2013, and Hansen was named IRB coach of the year for the second year running. The All Blacks retained the Rugby Championship and Bledisloe Cup, and won 14 of 14 matches, becoming the first team to ever do this in the professional era. In 2014, having already defeated England 3–0 on their tour, New Zealand lost their first ever Rugby Championship match to South Africa 27–25 in Johannesburg. They had also drawn their opening match of the Championship with Australia 12–all. Despite this, they retained their title for a third consecutive year. Hansen later led the team to a further three victories on their European tour, to see him be named World Rugby coach of the year, again. In a shortened Rugby Championship, the All Blacks failed to retain the title they held for three years, losing to Australia 19- 27. During the 2015 Rugby World Cup, the All Blacks beat France in the quarter-final 62–13 and South Africa 20–18 in the semi-final. They faced Australia in the final, winning 34–17 to become the first team ever to retain the Webb Ellis Cup. He also led the All Blacks to their first ever foreign Rugby World Cup victory. They also became only the second team to win on British soil with Australia having won both previous tournaments in 1991 and 1999. Hansen se indrukwekkende loopbaan eindig oor twee jaar. Die gedagte is blykbaar dat hy die plaasvervangers van spelers soos McCaw en Carter in die span sal integreer voor hy die leisels sal oorgee aan een van die huidige assistant-afrigters. Dit sal kontinuïteit verseker in wat waarskynlik die beste rugbyspan ooit is. Wat het ons, en wat gaan ons doen? Kyk Noord en donner voort?